Ezra Pound liked his books charged with meaning. “Man reading should be man intensely alive. The book should be a ball of light in one’s hand,” he wrote in his Guide to Kulchur, another one of his, shall we say, B-Sides. 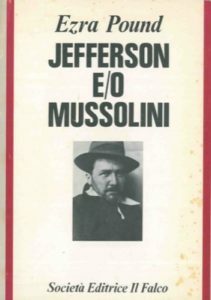 In Jefferson and/or Mussolini (henceforth, and/or), Pound evokes two figures with seemingly different tastes and circumstances and juxtaposes their qualities. This book is not as disciplined as his Cantos or his other poetry books, but it is an important piece for any Pound scholar or fan. It is written in media res while Mussolini reigns in Italy and before the Second World War. He is well aware of how baffling it sounds, but he weaves his literary ideogram of these two men of genius with typical adroitness. And/or reads as a proto-blog, akin to his ABC books, where he writes sentences that could come off as pretentious or simple and leaves the genuine reader sifting through history and literature trying to exact his meaning. For example, Pound is surprisingly lenient towards Lenin, “who alone may have undertaken more responsibility” than Il Duce. This responsibility is akin to Jefferson’s, who recognized himself as an aristocrat of the soul — or at least the intellect — and followed the path of responsibility. I am not comparing Lenin to Jefferson here. Pound’s views of Lenin are peripheral here. First it is important to understand Pound’s view of the United States and this will better help us to see how these two revolutionary figures are connected. Pound’s view on American History is the fulcrum of any argument for his patriotism, and the crux of his sincere views towards European tradition on the American continent. It is said that the English colonies rebelled due to “taxation without representation,” one of the Ivory Tower’s most successful kernels of misinformation, but because the Bank of England — the usurers there in the City of London — felt threatened by the provincial money across the Atlantic. “The inability of the colonists to get power to issue their own money permanently out of the hands of George III and the international bankers was the prime reason for the Revolutionary War,” reports Benjamin Franklin. This is the continuing revolution, the man of public spirit versus the grafters and men seeking private gain. 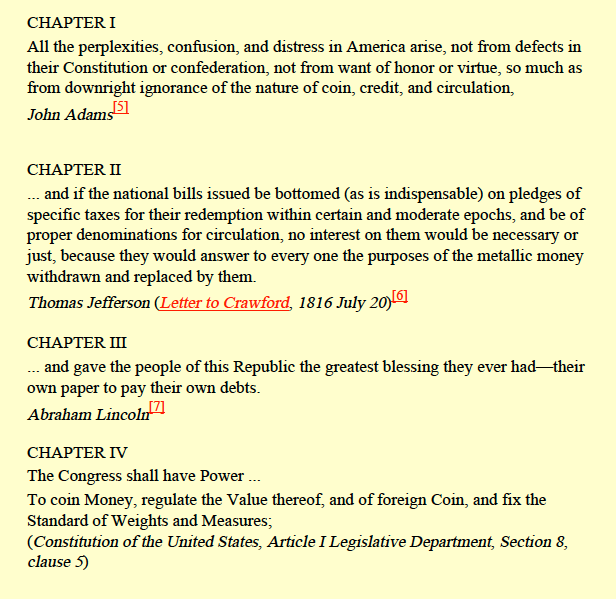 Early on the reader is told the angle at which Pound is looking at this seeming dichotomy, “I am concerned with what he [Jefferson] actually did, with the way his mind worked both when faced with a particular problem in a particular geography, and when faced with the unending problem of CHANGE” (p. 11). Jefferson famously said, “The best government is that which governs least.” Pound elucidates that “shallow interpretations puts all the emphasis on the adverb ‘least’ and slides gaily over the verb ‘to govern’” (p. 15). How did Jefferson germinate this maxim into early American life? This is important since Pound is only concerned with ideas that can be brought into action. That, to him, is the only way an idea should be weighed. Anything that is only good in theory can be thrown in the garbage. With a limited electorate, Jefferson was able to guide this electorate publicly and share his ideas through conversation with the intelligentsia of his era. These ideas and perceptions were worth their salt, too. “No man in history had ever done more and done it with less violence or with needless expenditure of energy. . . . Given the obvious ‘weakness of the American colonies AND geography, he committed the greatest single territorial conquest or acquist [sic] that either you or I can at the moment recall,” he writes in reference to the Louisiana Purchase (p. 15). Jefferson knew the nation could not go to war, nor thought it necessary to do so when he could simply throw Napoleon some money to more than double the nation’s borders — and allow Europe to bludgeon itself while the former Colonies went through pre-pubescence. The former “has a definite aim, and creates out of the materials present . . . and this is a matter of WILL” (p. 16). This opportunism brings us to the other side of the coin, Il Duce. Pound asks rhetorically, “What would Tom Jefferson do and say in a narrow Mediterranean peninsula containing Foggia, Milan, Siracusa, Firenze, with a crusted conservatism that no untravelled American can even suspect of existing” (p. 23). Pound spends a lot of pages attempting to explain to the reader how complex Italy is, far more complex than Russia, “Lenin did not have the Vatican in his front garden” (p. 25). An excited Milanese curses the Neapolitan for an African, the old civilization of Rome, the duchies and kingdoms united recently — if there is any truth on the Italian peninsula, it is that the truth is different up and down it. And this is where we get Mussolini the artifex. He has materials and he has the will. “Take him anything as the artist and you will get muddled with contradictions” (p. 34). For Pound, he is a genius. He sees ten things where the common man sees one “PLUS the ability to register that multiple perception in the material of his art” (p. 88). He called bluffs, and Pound touts him as a debunker. He had an interest in machinery only in so far as it could benefit the people and not turn them into cogs (a similar distrust was found in Jefferson). He had to keep labor in Italy, the inverse problem of Jefferson, who never could have conceived men leaving the United States for Napoleonic or Royal Europe (p. 71) . . . The secret, of Mussolini, “is. . . the capacity to pick out the element of major importance in any tangle and go straight to the center . . .” (p. 66). And a major component was the nationalization of banks in March 1936, that is, kicking out the banksters, and Pound reports that after the First World War, Italy was the only “clot of energy in Europe capable of opposing . . . the infinite evil of the profiteers and the sellers of men’s blood for money” (p. 61). Furthermore, Fascism for Pound is the first anti-snob movement in Italy since Cato the Younger. Mussolini juggled the crusted conservatism and the energy, the north and the south, the Vatican with inspirational enthusiasm. Something Italy needed since the shadow cast by Dante’s Divine Comedy, and going further back, Rome herself. Or as Pound puts in a Jacksonian colloquy, “All right, bo’, you come along with a card deck, set card for each clot of theories, demo-liberal, bolshevik, anti-clerical, etc., and make that junk-shop into a nation, a live nation on its toes like a young bull in the Cordova ring” (p. 67). The types of people to make such a nation are not the opportunists like the all too common war profiteer or young, ambitious usurer fresh out of the Wharton School, but those “who are interested in the WORK being done and the work TO DO, and not in personal considerations, personal petty vanities, and so on. Such impersonality seems to me implicit in fascism . . .” (p. 68). Responsibility to the nation. Just like Jefferson. Between this truer sense of freedom of the press, and the government governing least, the “continuing revolution” as Pound is wont to call it, is easily bridged. With Mussolini and/or Jefferson, we have three major themes with superficial differences that paint their particular histories. They are: direction of the will, duty and responsibility, and genius. Where Jefferson was a polumetis on the frontier of the Atlantic seaboard with raw material and energy to spare, Mussolini had millennia of inherited theories, styles, classes, and regions all with diverse perceptions of one another — with barely a cohesive tongue — and was able to free what energy the peninsula had and put ideas into action and make the young generation excited about their country. The would-be fascists would have to make a dispassionate analysis of fascism on the hoof, the rivoluzione continua as it has been for over a decade, its main trend, its meaning; and they would profit by such study in considering what elements can be used in either England or America, the general sanity and not the local accidentals, not the advisabilities [sic] of particular time and place but the permanent elements of sane and responsible government. 1. The Money Masters — How International Bankers Gained Control of America, directed by William T. Still (1996), VHS. Published: December 20, 2016 | This entry was posted in North American New Right and tagged Adam Franz, Benito Mussolini, book reviews, Ezra Pound, fascism, Italy, Jefferson and/or Mussolini, North American New Right, originals, populism, Thomas Jefferson. Both comments and trackbacks are currently closed. 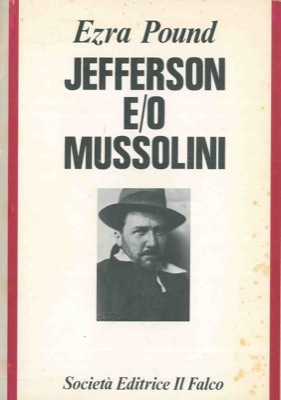 This is one of the best explications of Jeffers0n and/or Mussolini I’ve read and as Pound fan I’ve read quite a few. Well done — you bring the text alive and make it relevant. As an historical figure, Mussolini is both seriously misunderstood and misrepresented. Renewing interest in EP’s contemporary assessment is a good way of correcting the balance and reviving interest in the ideas and achievements of the Fascist Era. This an extremely interesting review. With all the daily commotion one all-too-often forgets that there are such most valuable writings such as those by Pound. The principles and the immediate appeal of fascistic thought has always struck me. There is life blood in these words, the movement, the ardor with which it was lived. The left and sterile academics on grant support can only come up with formulaic superficialities, such as the effects and common measures taken by fascistic governments. Hence, Corporatism is supposed to define Mussolini’s Italy. There is clearly a complete lack of understanding from this side of movements which are based on non-analyzable phenomena. London’s comment above ends with naming such a phenomenon, >race soul<, and that might very well be the very essence of Fascism. If you’ve ever wondered about what ‘paideuma’, (first coined by Leo Frobenius (1873-1938), German ethnographer), actually is, (apart from being the name of a timid journal of Poundian studies, that is), there’s an interesting article on ‘The Overweening Generalist’ site, (a site originally coneived by the co-inventor of Twitter, Evan Williams, as ‘ largely about people who like to read fat, weighty “difficult” books – or thin, profound ones – and how I/They/We stand in relation to the hyper-acceleration of digital social-media-tized culture. It is not a neo-Luddite attack on digital media; it is an attempt to negotiate with it, and to subtly make claims for the role of generalist intellectual types in the scheme of things’), that may be of some service. It contains a telling sentence. ”Joseph Campbell had been very much taken by Frobenius too. As Robert Ellwood writes in the section on Campbell in his book ‘The Politics of Myth’, ‘’He was struck by Frobenius’s comparable concept that every race had its own paideuma or soul, its own way of feeling and its own spectrum of significant knowledge.” If you want a quick definition then, I’ll give you one – ‘race soul’.